The tale of duplicitous husband and father Julien, a real estate agent who falls in love with Alice, a young client - who, it turns out, works in Julien's wife Marie's tea shop. Pianist deemed Edouard Choiseur continues to run between sentimental and professional contingencies. When his wife threatened to leave him, he decided to devote some time to his family. In a future where dying of illness is exceedingly rare, a terminally ill woman becomes a celebrity and a man with camera implants goes to secretly record her for a morbid TV show. I was repulsed by this film. I couldn't understand why Jeanne Moreau, who didn't age gracefully by any stretch of the imagination (or the plastic surgeon's art), would expose her ugliness - both physical and moral - in this vehicle about an ageing female crook without any redeeming qualities falling in love with a younger man and pushing her equally decrepit ex-lover to suicide in the process. Thanks to Ms. Moreau, her character is seen as vulgar, sly, coarse, selfish, calculating, heartless and sexually decadent. Then, I read the novel by San Antonio and everything became clear. 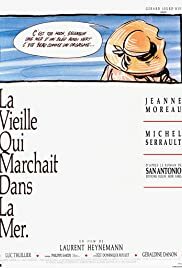 "La Vieille qui marchait dans la mer" is a masterpiece of the French language, which is surprising coming from an author who has specialized for decades in the kind of literature made popular by Simenon and Mickey Spillane. It is one of the definitive French works of fiction explaining the nature of physical attraction. It is also surprising that such a macho writer would take the trouble to delve - with such eloquence - into the meanders of a woman's soul. In the novel, the old woman's intentions and her love for her young protégé are clearly understood through her many frank dialogues with God. The novel's character benefits from not being "seen" (except in descriptions) so that we can judge her soul and not her body. Unfortunately, the spectacle of Ms. Moreau's spectacular decrepitude - playing an 85 year arthritic old woman at age 63 - is enough the prejudice anyone against the personage she is supposed to interpret and the whole thing comes off as a freak show in very bad taste - "What Ever Happened to Baby Jane" meets "The Grifters". Still, one has to admit that it took quite a bit of courage - or recklessness - on Moreau's part to expose oneself in that way for all the world to see. And the film does take an added resonance when one has read the novel. It would have taken more imagination and a better director to actually transpose the novel's many interiorized levels of meaning and fleeting glimpses of poetry to the screen. As it is, the movie is only the exact physical equivalent of the book's unflinching descriptions, locales and storyline. It's the same difference that separates Mary Shelley's original "Frankenstein" novel (romantic, introspective, reflective and philosophical) from all its adaptations (outright horror films).